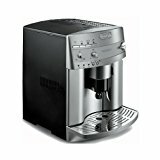 Currently viewing the category: "Gaggia Espresso Machines"
It’s no doubt that Italian brand Gaggia makes excellent super-automatic espresso machines. With the release of their Anima super-auto line, they released 3 Anima machines that are seemingly similar, but with different price tags (why must they always confuse us this way!). In this post, we’ve done all the research for you and wrote down the difference between these models. 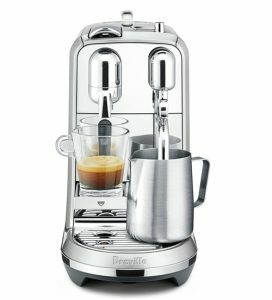 Fully automatic espresso maker with LCD display. Built-in ceramic burr grinder with 5 adjustable settings. Pre-infusion option ensures maximum saturation and flavor extraction. Pannarello steam wand with Chrome plating. 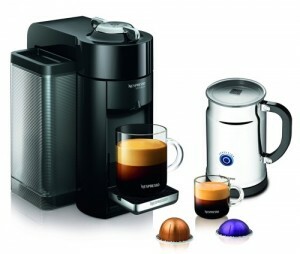 Pre-programmed buttons: Espresso, Lungo, Aroma Strength, Steam, Hot Water. All can be reprogrammed to your taste. Digital display makes it easier to program your machine, also display maintenance alerts. 60 oz water reservoir capacity. 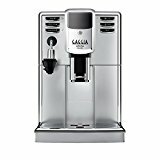 Click here to learn more about Gaggia Anima Super Automatic Espresso Maker, read the customer reviews and buy it. 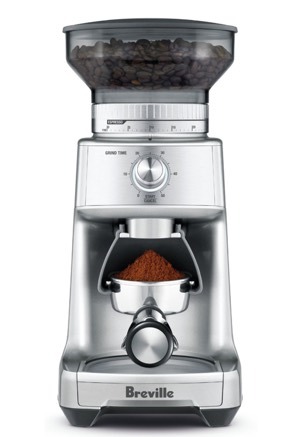 Built-in ceramic burr grinder with 5 adjustable grind settings. 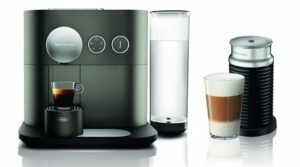 Pre-programmed buttons: Espresso, Lungo, Aroma Strength, Milk Froth, Hot Water. Bypass doser for pre-ground coffee. 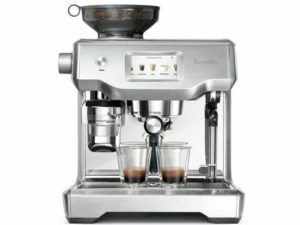 Click here to learn more about Gaggia Anima Deluxe Super Automatic Espresso Maker, read the customer reviews and buy it. 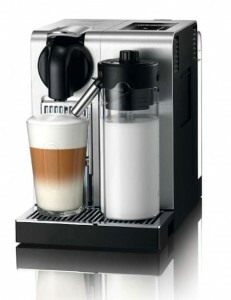 Built-in milk frothing carafe for fully automatic frothing and milk dispensing. 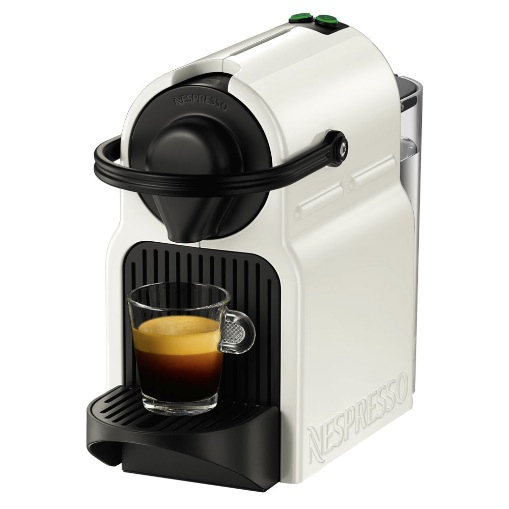 Pre-programmed buttons: Espresso, Lungo, Aroma Strength, Cappuccino, Latte Macchiato. 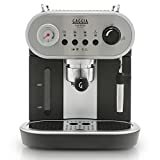 Click here to learn more about Gaggia Anima Prestige Super Automatic Espresso Maker, read the customer reviews and buy it. 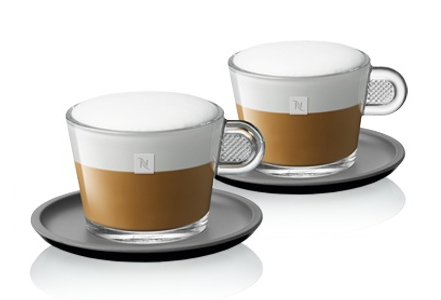 What Is The Difference Between Gaggia Anima, Anima Deluxe and Anima Prestige? 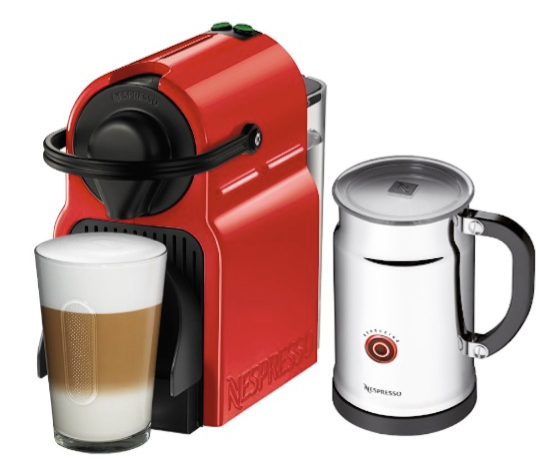 There are two main difference between each of these models: The pre-set buttons and the milk frother style. 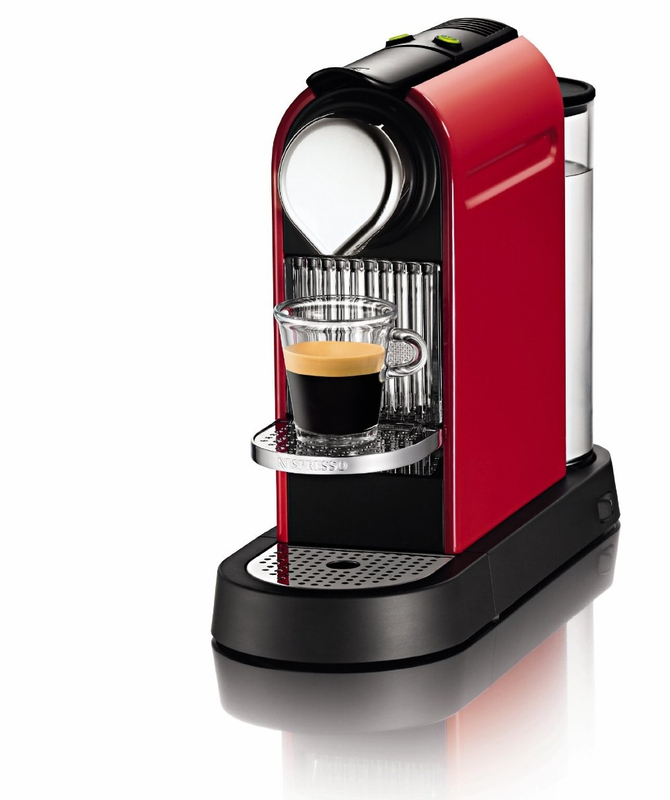 In the Gaggia Anima, you have one-touch buttons for espresso, lungo and steam. 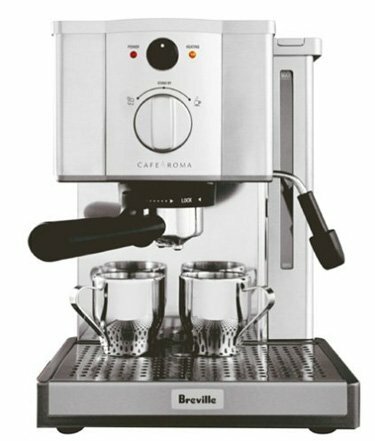 This means, when making a Cappuccino for example, you’ll have to brew the espresso then manually froth your milk by hitting the steam button. 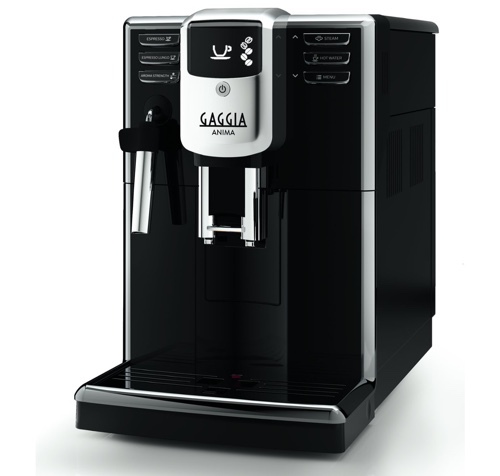 The Gaggia Anima is the baseline model and has a plastic exterior. With the Anima Deluxe, the frother is automatic, how it works is you connect the frother to your frothing jug using an attachment and it will automatically froth your milk and pour it into your cup. 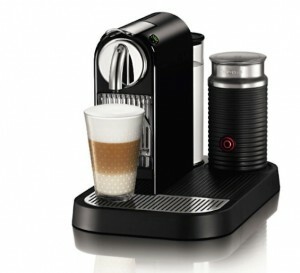 The pre-set buttons on it are Espresso, Lungo, Milk Froth as well as the standard aroma strength and hot water. Another thing is that the Anima Deluxe has a brushed metal exterior. Finally we have the Anima Prestige, the top of the line model. 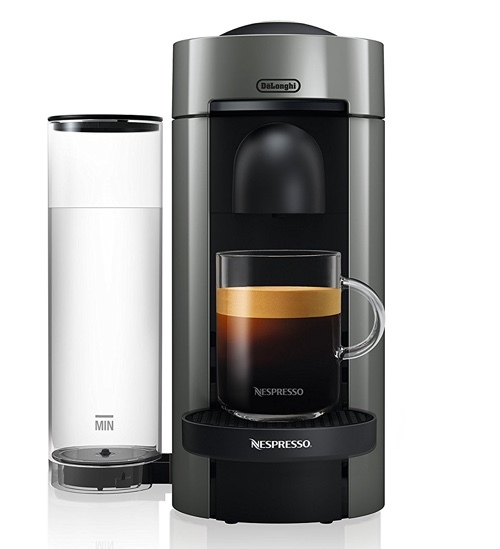 This one includes a built-in milk container so the machine automatically draws milk from it, froths and dispenses it into your cup. Not only that, it actually does it all automatically, so can select a Cappuccino or Latte and it will brew the espresso and froth and dispense the milk all with one touch. The milk container is detachable, so any left over milk can be stored in the fridge. The pre-set buttons on this model are Espresso, Lungo, Cappuccino and Latte. Like the Deluxe, the Anima Prestige has a metal exterior as well. Saeco Aroma vs. Gaggia Classic: Which of These a Better Choice For You? 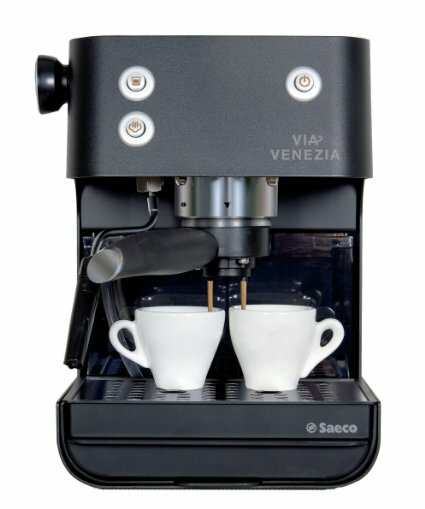 Saeco’s Aroma and Gaggia’s Classic both make a great choice for a compact and traditional-style espresso makers. 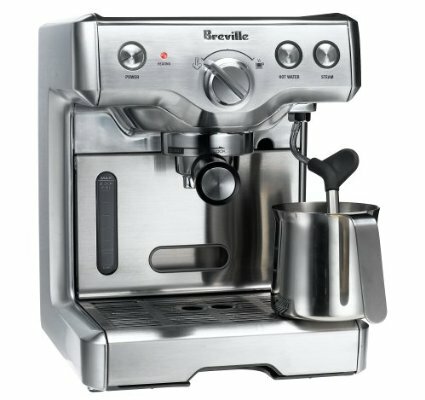 They’re both manual espresso machines, yet they’re very beginner friendly and easy to use. In this post, we’ll look at the differences between the Saeco Aroma and Gaggia Classic to help you decide which one is best for you. 17 1/2 bar pump pressure with high voltage boiler. Frothing wand that also doubles as a hot water dispenser. Portafilter with brass group head for temperature stability. Includes single and double shot baskets, coffee scoop/measure and a tamper. Ability to brew using ground coffee or E.S.E pods. 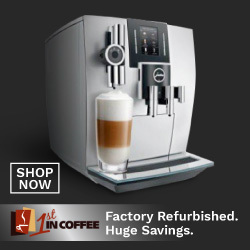 Click here to learn more about Gaggia Classic, read the customer reviews and buy it. 15-bar pump pressure, stainless steel boiler. Frothing wand with hot water dispenser. 85 ounce removable water tank. Portafilter with single/double baskets and E.S.E pod adapter. Click here to learn more about Saeco Aroma, read the customer reviews and buy it. 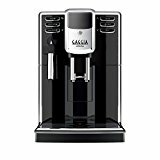 What Is The Difference Between Gaggia Classic and Saeco Aroma? The Gaggia has a higher pump pressure, 17 1/2 bar vs. 15 bar for the Saeco Aroma. But this isn’t a huge deal really. 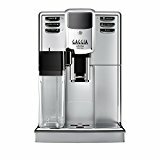 The Saeco Aroma has a larger water reservoir with 85 oz capacity while the Gaggia Classic has 72 ounce. The Saeco Aroma is smaller in size, if that’s a priority for you. 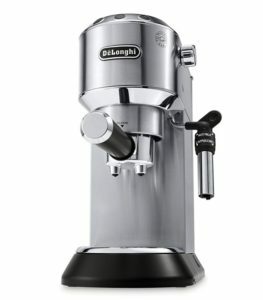 The Gaggia Classic’s grouphead on the portafilter is made of metal entirely, this gives you better temperature stability when brewing and results in better espresso extraction. 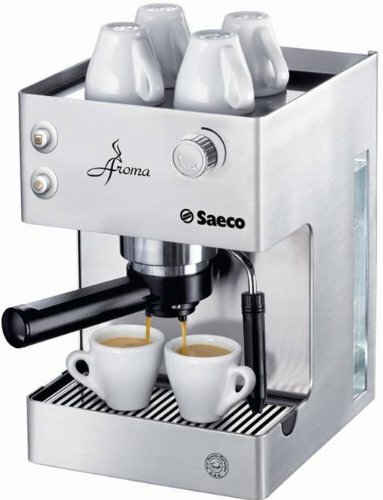 The Saeco Aroma has metal baskets but the grouphead is plastic like the handle of the portafilter, which is fine in general, but isn’t as good as the Gaggia Classic. 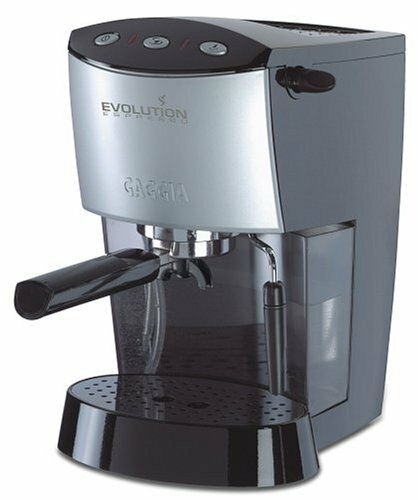 We would recommend the Gaggia Classic simply for its superior grouphead/portafitler, which means a hotter and better espresso shot. – Is there wait time between brewing coffee and frothing milk? Yes, like any single-boiler espresso machine, you’ll have to wait between the two tasks. For the Gaggia Classic, it’s about 60 seconds. – Can I Use Pre-packaged E.S.E pods? 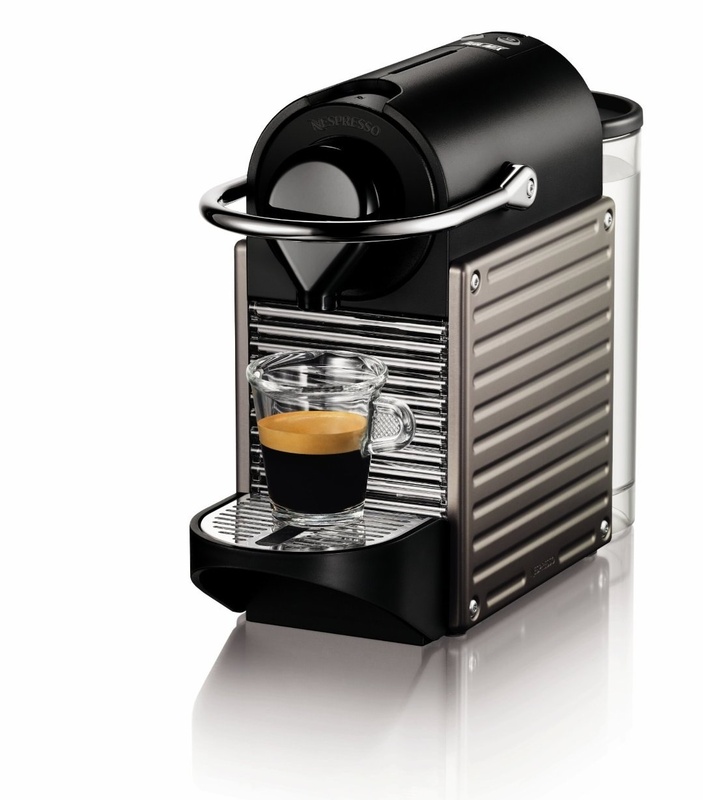 -What Do I need to buy with my espresso maker? The Gaggia already includes a coffee scoop and a tamper, so you’ll only have to include a frothing jug. As for the Saeco Aroma, no tamper is needed as the portafilter is pressurized, but you’ll still need a frothing jug. We recommend this one by Update International which will cost you less than $10. 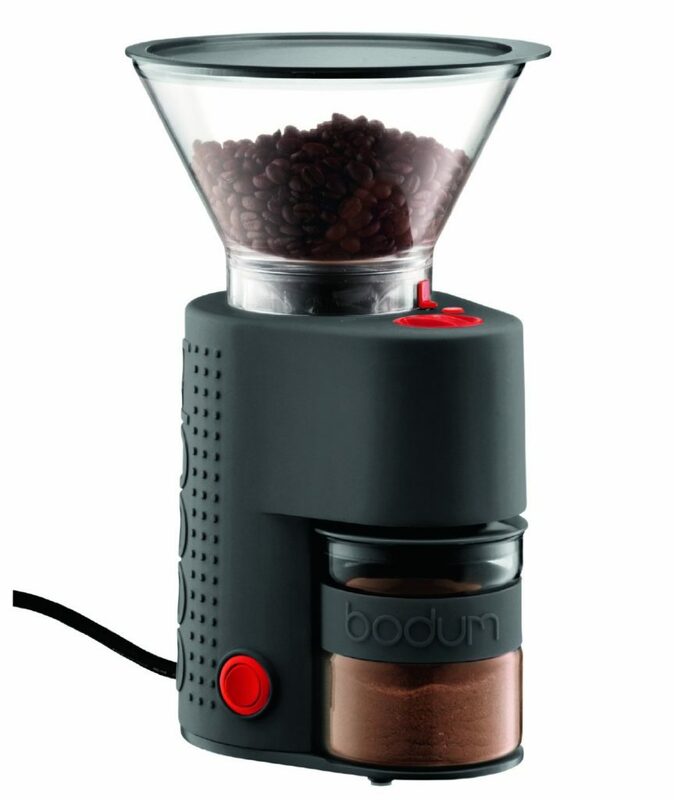 -Do I need a coffee grinder? 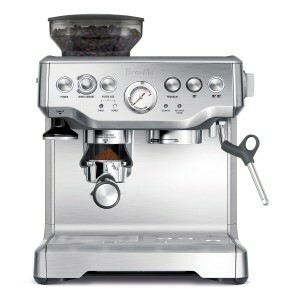 A freshly ground coffee is one of the most important factor in espresso brewing. 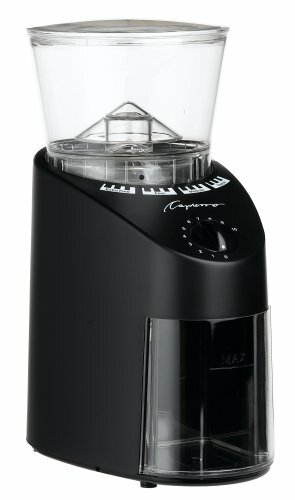 If you don’t have a grinder yet, have a look at our recommended conical burr grinders here. 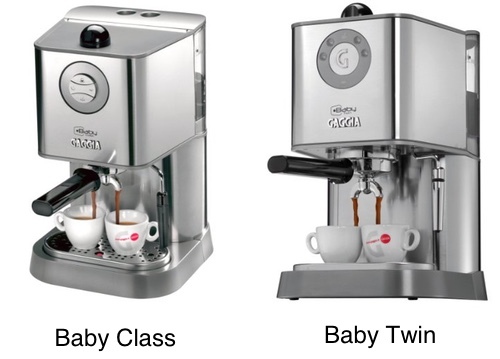 Gaggia Baby Twin vs. Baby Class vs. Classic: What Is The Difference and Which Is Best? 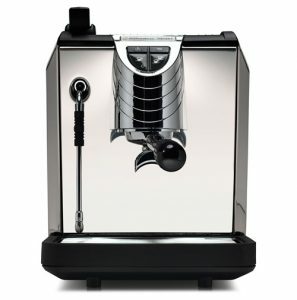 Gaggia makes beautiful, high-grade, Italian made espresso machines. That’s a fact that is true to all machines made by the Italian manufactures of espresso makers. 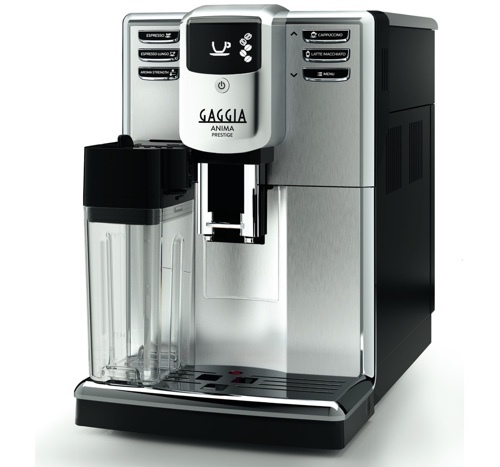 The Baby line by Gaggia make wonderful home espresso makers that are suited for beginners as well as advanced users. 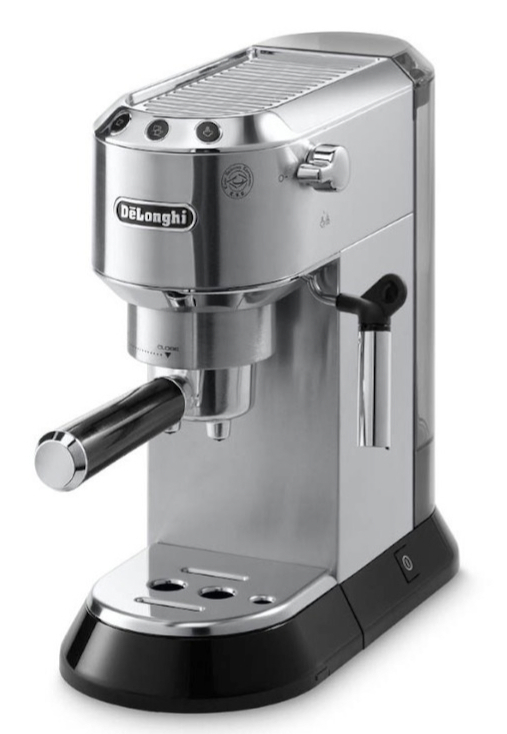 In this post, we’ll look at the similarities and differences between these two espresso makers so you can pick the one most suited for you. 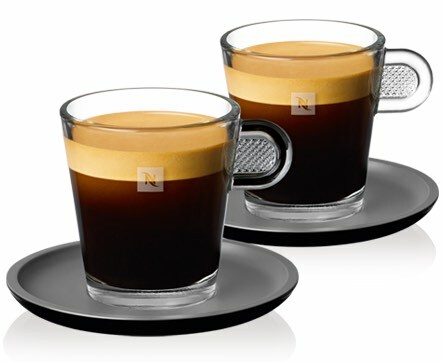 Gaggia Baby Class vs. Baby Twin, What’s The Difference? At the core, both the Gaggia Baby Class & Baby Twin have the same parts. Both have 15 bar pressure pump and 1300 Watts power. Both have steam wands that also work as a hot water dispenser. Included filter: single shot, double shot, e.s.e pod filter. Water reservoir capacity for both: 1.6L (around 60 oz). The Gaggia Baby Twin has a dual heating system, which means it works faster and allows you to go from espresso extraction to milk frothing without any wait time. The Gaggia Baby Class has a single boiler. 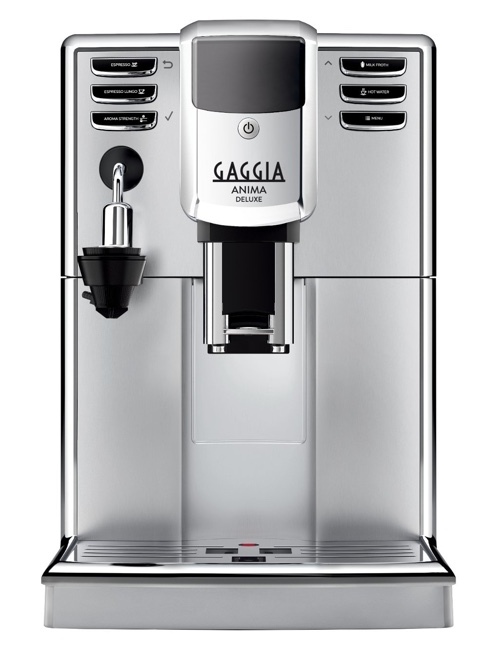 The frothing wand on the Gaggia Baby Twin is stainless steel, unlike the Plastic frother on the Baby Class. The control panel: On the Baby Twin, the controls are soft-touch. On the Baby Class, it’s push-button. Also, the Baby Twin allows you to reprogram the control buttons. So you can choose to have the shot volume reprogrammed to your liking. This feature is not available on the Baby Class. 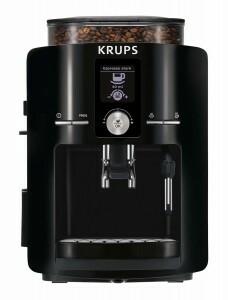 The Baby Twin has a pre infusion feature which infuses the coffee ground with hot water before extraction. This allows for a even and flavorful extraction of the coffee. Personalization: reprogram your control buttons. Dual heaters: quick start up and no wait time between frothing and extraction. Pre-infusion function and better milk frother. For those extra features, the Baby Twin comes at a price range around $100 higher than the Baby Class. 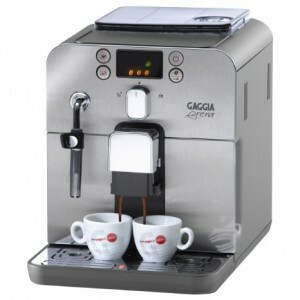 Click here to learn more about the Gaggia Baby Twin, read the customer reviews and buy it. 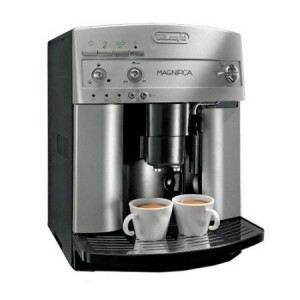 Click here to learn more about the Gaggia Baby Class, read the customer reviews and buy it. 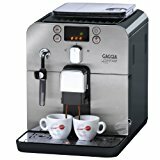 Which Is Best To Buy, The Gaggia Baby Twin or Baby Class? Now you’ve read their features, similarities and differences, you should know which of these would be best for your use. It also comes down to your budget, really. If you’re willing to pay less or extra for a few features of lack of them. Gaggia Baby Class vs. Gaggia Classic, What’s The Difference? 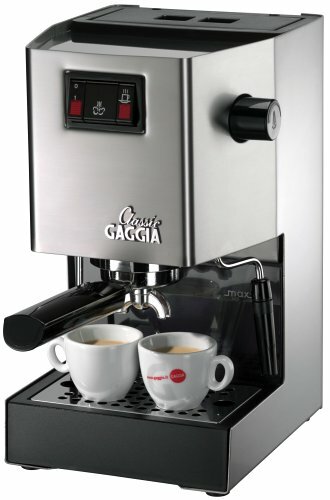 The Gaggia Classic has higher pressure pump, 17 bar vs 15 bar for the Baby Class. The Classic also has a larger water reservoir at 72 oz vs 60 oz for the Baby Class. 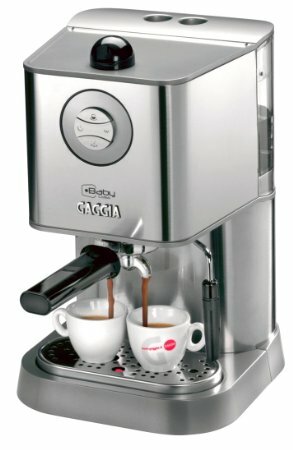 The Control buttons on the Gaggia Classic are switch buttons vs. push buttons for the Baby Class. 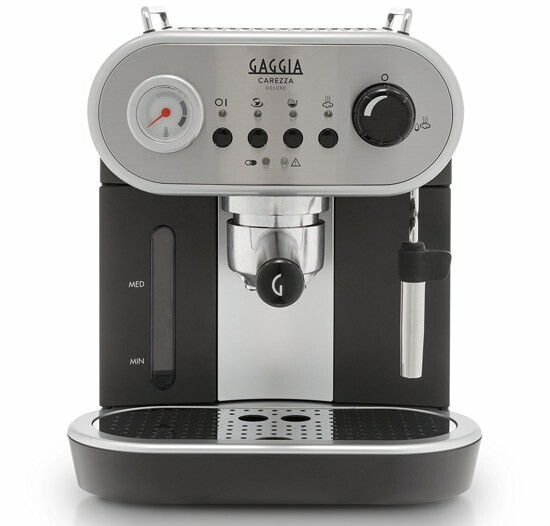 Both machines have stainless steel exterior, but the drip tray on the Gaggia Classic is plastic. 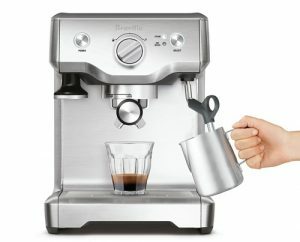 Rancilio Silvia vs. Gaggia Classic 14101: Which Of These Espresso Machines Should You Buy? In this post, we’ll be comparing the Rancilio Silvia vs the Gaggia Classic, two superior espresso machines that make a great upgrade for an intermediate to an advanced user. Both of these machines are made of commercial grade material with the home user in mind. So when buying either of them, you’ll be getting really high quality. These are NOT automatic machines, so you’ll need to know what you’re doing in order to produce a good shot of espresso, that’s why we’re recommending this for at least an intermediate user. Stainless steel housing with ergonormic porta filter handle same as Rancilio’s commercial machines. Commercial grade group head offers heat stability and great extraction quality. 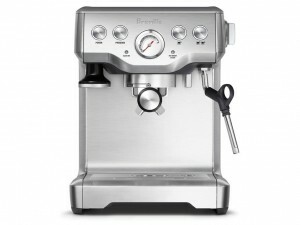 Single boiler that has the largest volume capacity for a home espresso machine. Stainless steel steam wand for milk frothing. Includes: coffee scoop, tamper, single and double shot filter baskets. brass portafilter and group head for heat stability. Plastic milk frother. Also works as a hot water dispenser. Includes: single and double shot filter baskets, coffee scoop and tamper. 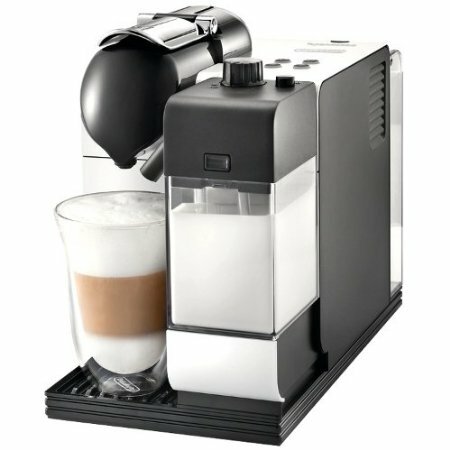 The Gaggia Classic has a larger water reservoir than the Rancilio Silvia. 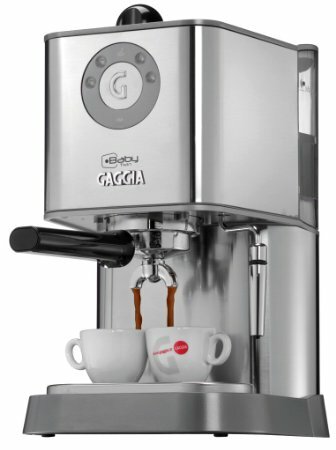 The Gaggia Classic has a smaller boiler than the Silvia. Although the Silvia takes longer to heat up, it can deliver more shots without having to pause, making it perfect for larger families or for entertaining. The Silvia can only use ground coffee. 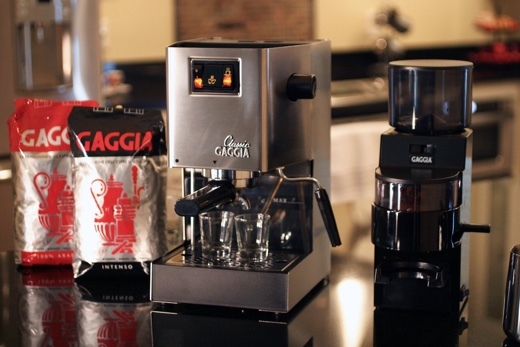 The Gaggia Classic can use both ground coffee or e.s.e pods. 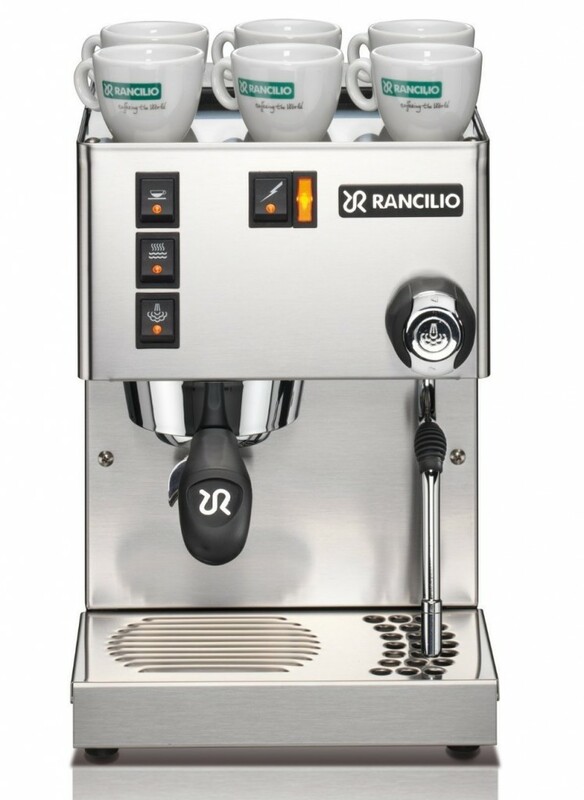 Overall, the Rancilio Silvia is more powerful with the largest boiler for its category. 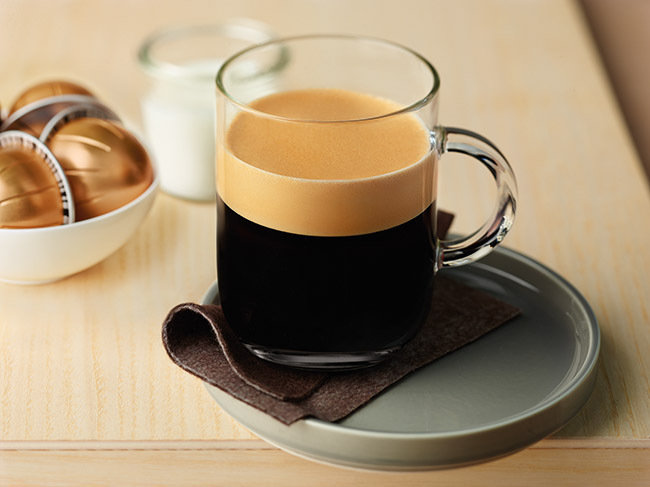 The Gaggia Classic is perfect for making a single or double shot at a time, it might get tricky if you’re entertaining a large number of people for example, as it will need some ‘rest time’ between every few shots. 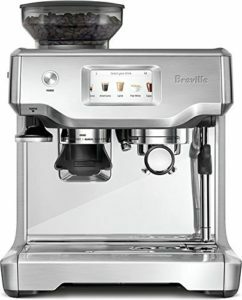 To deliver excellent coffee, both machines will require a high quality grinder to prepare the coffee ground right before brewing. See our of the top rated conical burr grinders for some recommendations.